Planning your garden is one of winter’s most enjoyable activities. And every garden plan should include space for at least a few open pollinated heirloom tomato seeds. There are hundreds of heirloom tomato varieties to suit any climate, soil or space. You can plant sprawling indeterminate heirloom vines that stretch up to ten feet in height, or grow a dwarf or cherry variety that will thrive in your windowsill, producing abundant red, yellow or purple morsels for your summer salads. Their is nothing more satisfying in the cold days of February than leafing through an colorful heirloom tomato seeds catalog, or any other seed catalog for that matter. Even though it is brisk or maybe even blustery outside, you can start daydreaming about leafy green plants, delicate yellow flowers and the incredible juicy burst of flavor when you bite into the first heirloom tomato of the season. Tomato Fest – Search hundreds of unique heirloom tomato seeds by color, shape, preferred climate and type. You can even find discounts on bulk TomatoFest heirloom tomato seeds, so get together with some friends and start shopping! Burpee – That’s right, the famous seed company offers a wide array of heirloom tomato seeds. They also have heirloom basil, squash, strawberries and cucumbers. Burpee even offers heirloom flower seeds, including heirloom marigolds, nasturiums and more. Heirloom Tomatoes – Join the Tomato Club and receive a weekly newsletter filled with growing tips and advice for getting the most out of your heirloom tomatoes. They also offer seed packages including herb and vegetable mixes. 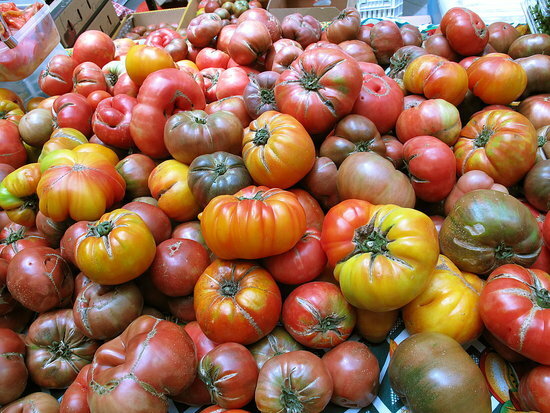 Tomato Bob’s Heirloom Tomatoes – Tomato Bob has more than just heirloom tomato seeds for sale. Get heirloom seeds for hot peppers or flowers, beautiful live plants in season. Most heirloom tomato seeds are indeterminate. This means that they continue growing after the start flowering, and continue producing flowers over time. You can keep picking tomatoes all summer long from a vigorous indeterminate vine. But sometimes you want a determinate heirloom tomato. On these plants all the fruit develops at once, allowing for a single harvest. This is helpful if you are planning on canning tomatoes, as you can do one big batch of sauce, juice or whole canned tomatoes at one time. Andes – This meaty pepper shaped tomato grows to five inches in length and has few seeds, making it a good sauce and paste tomato. Aurora – This Russian variety thrives in difficult climates. If your garden is chilly, damp or at a high altitude try growing these bushy little plants. They are amazingly productive, giving abundant yields of 6 oz canning tomatoes with great flavor. Pride of Flanders – This is a determinate cherry tomato variety, that grows as a small bush and produces heaps of dark purple tomatoes with bright green insides and a tart flavor. A great early choice for selling in the farmer’s market. Roughwood Golden Plum – A beautiful yellow and orange plum tomato, Roughwood is a productive paste tomato. The flavor is amazing and rich, their are few seeds and the best part? You get golden tomato paste! Did you get free heirloom tomato seeds from a friend or neighbor? Use this easy germination and seed viability test to see if they are worth planting.